First, it was the belly dancer I lusted over. Now, Loretta Swit’s cousin – you know, the actress best known for her role as Major Margaret “Hot Lips” Houlihan on MASH – found a post where I had mentioned her. I was discussing my newly-discovered Polish heritage, and gave a shout-out to some famous Polish people like Loretta, joking that we might be related. Her cousin Stan stumbled across it and explained that his grandfather and her grandfather were brothers, and everybody is always asking how she is doing, which is frustrating to him because he’s only met her a couple of times when they were younger. He has no idea, people! Leave him alone!! You’re welcome, Stan. Hope that helps. By the way, how is Loretta these days? I just find it fascinating that people I write about seem to find me and write back. It’s amazing how small the world really is. I need to use this to my advantage, and start writing about Stephen King. Maybe he’ll discover my post, read my book, and spread the word to everybody he knows about how great it is. Stephen King Stephen King Stephen King Stephen King Stephen King Stephen King Stephen King Stephen King Stephen King Stephen King Stephen King Stephen King. There. That oughtta do the trick. Actually, I probably just spammed my own post. Google frowns upon overuse of key words and phrases. They think you’re trying to cheat your way to the top of their rankings. I say it’s worth taking the chance in the hopes that Stephen King really does stumble upon this post. Anyway. How was your weekend? Mine was a bit ruff. You see, at one point I was sitting in the car in the parking lot of Walgreen’s while Tara ran in to pick up some prints she had ordered. There was an SUV parked a few spots over, with the driver’s window rolled down. A pair of dogs was making an awful racket, barking at everything that moved. So after scoping out the lot to make sure nobody else was around, I started barking back. I am not a mean-spirited person. And I’ve got nothing against dogs. I like them just fine! That doesn’t mean I want to hear them barking at every gust of wind. I like babies too, but when they’re bawling up a storm in public they’re just as annoying. I wanted to give the dogs a taste of their own medicine, because A) I was irritated, and B) I was bored. It wasn’t just a few barks, either. I was going all out, barking at the top of my lungs, deep and throaty and full of gusto, and they started going nuts. I threw in a little growling to really rile ‘em up. After about sixty seconds of this, an angry-looking face appeared in the window of the dog’s car while I was mid-yelp. I hadn’t realized there was somebody sitting in the passenger seat of the car. Well, I reached for the seat lever and dropped that sucker flat in about two seconds, and quickly rolled up my windows. I was still in that position, lying flat on my back, scrunched down as low as possible in order to avoid detection, when Tara arrived a few moments later. So I told her I’d gotten caught in the act of barking at a couple of dogs – an experience that was quite arf-ul – and naturally, she started laughing. By then the SUV had left, so at least I didn’t have to face the additional embarrassment of having to drive past them on the way out. Not my most fetching moment, that’s for sure. But the rest of the weekend wasn’t so doggone humiliating. Saturday we went out to brunch at a trendy little Southern bistro called Screen Door. It’s consistently voted one of Portland’s top breakfast spots, and the fried chicken and waffles are infamous. I’m happy to say the place lived up to its hype, and the 35-minute wait was made more bearable with coffee and Bloody Marys . (Here’s my Yelp review if you’re local and hungry or curious or from another part of the country (or another country) and bored and don’t have any dogs to bark at). 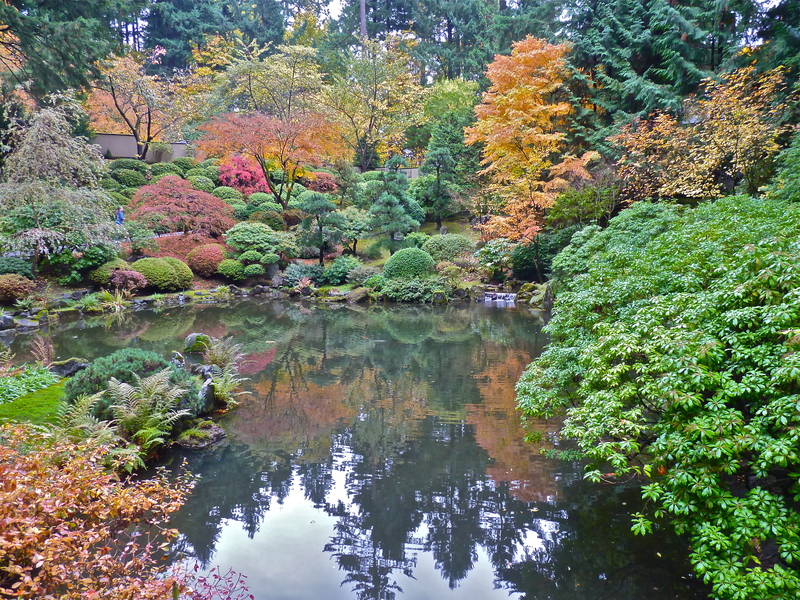 Later we went to the Japanese Garden to check out the fall colors, and then met up with a friend for dinner. Sunday was more laid-back and included a(nother) winning Broncos game on TV. All in all, a great weekend! 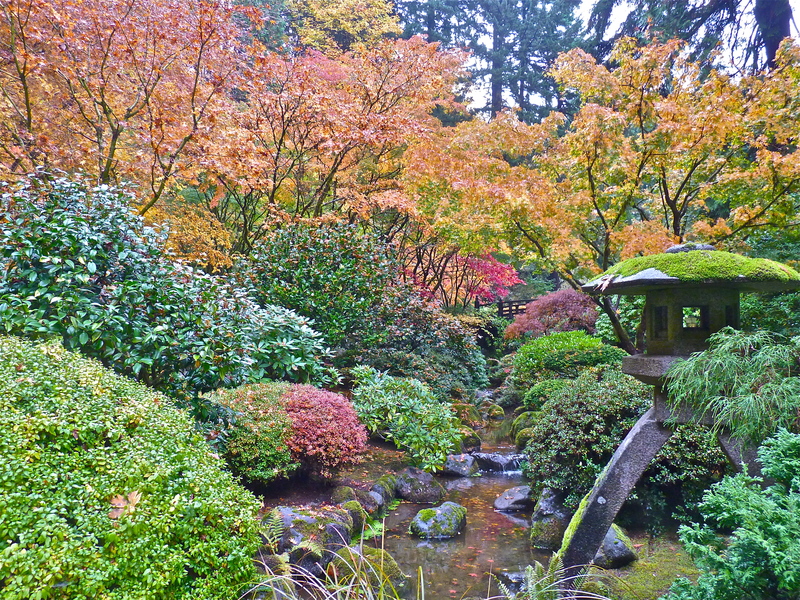 The Portland Japanese Garden. Beautiful in the fall. 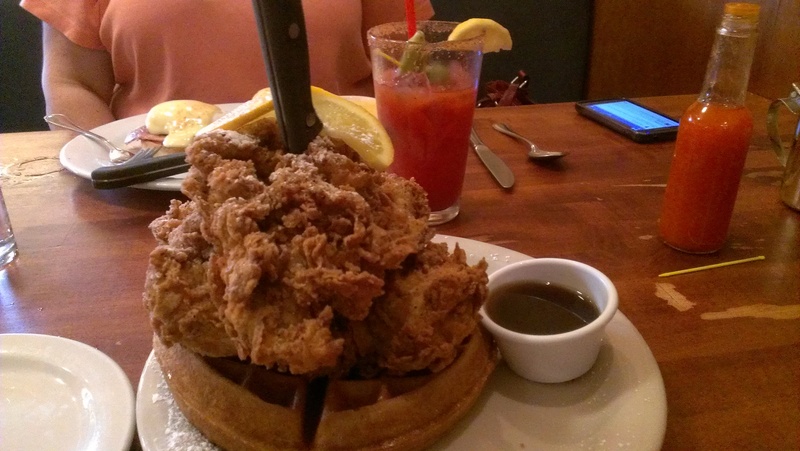 Chicken and waffles from Screen Door in Portland. I swear to God, this is the funniest damn thing I have EVER read! You would absolutely HATE my dog Lucy. Clue–Sara’s dad calls her “the Yapper.” Affectionately, of course. Believe that and I’ll throw you another bone. Good God, I can’t stop laughing. While waiting for our name to be called outside Screen Door the other day, somebody showed up with a bulldog. He was the cutest thing ever! Of course, he didn’t yap, so that helped. I am honored Mr. Petruska you’ve written about me. It’s always nice to collaborate with other authors such as yourself. Keeping writing, one word at a time. Bwhahahahhahahahahaha! Freakin’ HILARIOUS, Mark!! And could just see the look on your face when you saw that someone was sitting in that car!!! I’m like you, I love dogs too, but their constant barking drives me insane. My mother’s dog (Cosmo) is a sweetheart, but all he does is BARK! BARK! BARK! That’s why I adore cats, they’re basically silent little creatures. Faaaaaaaaaabulous photos! 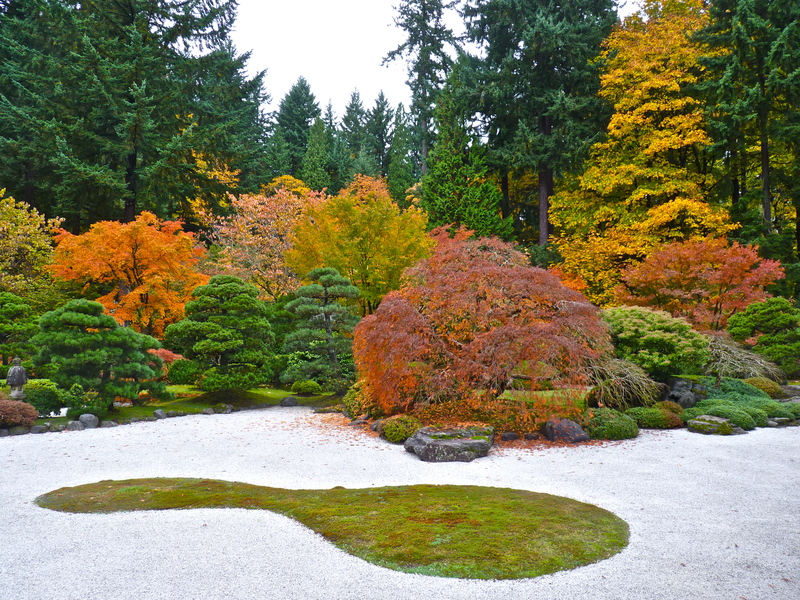 I love anything asian/oriental-looking, so I know I would have really enjoyed that Japanese garden. 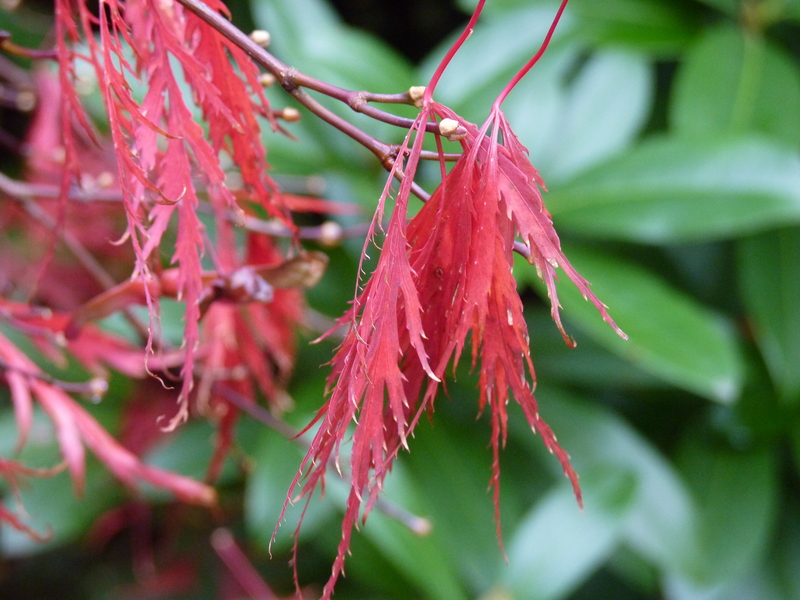 That photo of the red leaves is stunning! Thanks for sharing your weekend, buddy! And that’s why I’m a cat person, too. They’re silent AND they use the restroom discretely. What’s more to ask for in a pet? That’s not the real Stephen King commenting is it? You did this, right? It wasn’t me, lol. But I’m sure it’s somebody having fun with me. And I’ll bet you a dollar to a doughnut it’s that Tracy Cutler person. Okay…first off…nice try with the Stephen King…it was probably Tara! Cheater, ruff, cheater, ruff! Hahaha….just kidding! Loved all the pictures of the Japanese Garded. That place truly is beautiful! Cujo!!! What a perfect connection – I could have used that to tie the whole post together. Oops. Well, maybe I’ll end up writing about both dogs and Stephen King in the same blog post again sometime. Love the photos and I’m totally with you on the yappin crappers! I have a neighbor who is a nice lady, she’s retired and lives alone. I guess she decided she was too alone and got herself a yapper earlier this year. She must have grown tired of him because he spends a lot of time in the garage…yes, yapping…loudly. GAAAHHHH! Get a fish! You know, The Yappin’ Crappers would make a great band name! Oh yeah and if there are ever any takers on that, I wanna be a roadie! Honie the Roadie for the Yappin’ Crappers! HA! Thanks for the laugh I got while reading about the barking, I needed a good pick me up this afternoon and the pictures are gorgeous…I have now added another place I want to see in the world to my list. Aww…hope everything is okay. And glad that I was able to make you laugh, at least. What is Polish heritage? You mean your ancestors went around making things shiny? Did they manufacture floor wax ? Carl, it took me a minute to “get” this, but once I did I could not stop laughing. Especially considering that Tara is a cleaning Nazi!! My, you do lead a fascinating life. You had to have been really bored for you to bark that long at those dogs. I think it’s hysterical you got caught. But I’m totally jealous of your trip to the Japanese Gardens, we went there when we vacationed and it is a beautiful spot! My goal is to go there after a snowfall, Jess. Winter is the only season I have not experienced there. Na zdrowie right back at’cha! Mark! I swear to God that I did not make that Stephen King comment. This is what I get for not reading blog posts the very moment they get posted. (It’s Nov. 7th right now.) When I finally lolly-gagged my way over here, I decided early in my reading that I would comment, so that Stephen King would see that I’m associated with you when he came to read what you said. I see I missed my window. Lesson learned, I guess. Btw, my family calls those dogs yappy-little-f’ers. 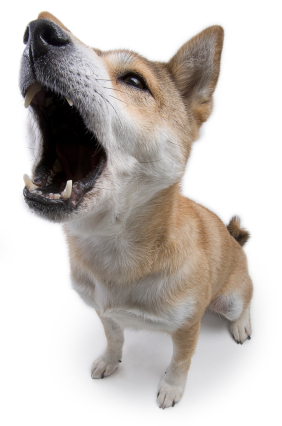 Real dogs bark rarely and are scary when they do. Perhaps Mr. King will grace us with his presence once more? Good thing you specified “pre drunk,” lol. You should have seen Tara and I on FB last Friday night after a few drinks. We lit the place up!